Over less than two human lifetimes, discoveries in physics transformed the world and our sense of place in the universe. We harnessed electromagnetic waves, thereby shrinking our planet to a village; an infinitesimal speck in a vast and inflating universe. After a long struggle, we learnt how to detect waves of space, gravitational waves, which allow us to hear the universe, thereby changing our sense of the universe once again. Each wave of discovery re-emphasises our transient and improbable existence in an equally transient universe. Our treasure, which is our life and our planet, grows in value as each successive discovery uncovers more and more threads on which our existence depends. Gravitational science has linked Western Australia to the world and to the whole universe. Einstein’s revolutionary theory of gravity was created while Western Australians were fighting in the first world war. In 1920 while Western Australia was still mourning those killed and wounded, Professor Alexander Ross, Foundation Professor of Physics at UWA campaigned for an international expedition to test Einstein’s extraordinary new theory during an eclipse of the Sun, best seen at Wallal Downs in the Kimberley. Two years later under instructions from Prime Minister Billy Hughes, a Trans Australian steam train carried a team of US astronomers and huge telescopes through Kalgoorlie and Guildford, en route to Wallal Downs. They provided the first indisputable proof of Einstein’s prediction that space is warped by matter. On 15th September 2015, a vast explosion of gravitational waves was detected by an International team that included more than 20 West Australians. They shared in the world’s richest science prize. The gold that enriched Western Australia was itself a mystery: where is gold created? In 2017 the same team heard a long drawn out siren sound of rippling space - the signature of colliding neutron stars. In their final crash, they slung out blobs of neutrons that exploded like a vast atomic bomb. The Zadko telescope at UWA’s Gingin Centre and many other telescopes observed this explosion and the tell-tale signature of gold. Professor David Blair’s work focuses on the methods for the detection of gravitational waves. He developed a niobium gravity wave detector and developed the first sapphire clock. He led the UWA team that participated in the first detections of gravitational waves. In May 2018 Professor Blair was elected to the Australian Academy of Science. In 2007 he received the Western Australian Premier’s Science Award for Scientist of the Year, in 2005 he was awarded the ANZAAS Medal and in 1995 he won the Walter Boas Medal of the Australian Institute of Physics. He leads education and outreach for the ARC Centre of Excellence for Gravitational Wave Discovery, OzGrav. The annual George Seddon Lecture is sponsored by the UWA Institute of Advanced Studies and UWA’s Friends of the Grounds. George Seddon (1927-2007) was an Emeritus Professor of Environmental Science at the University of Melbourne and a Senior Honorary Research Fellow in English at The University of Western Australia. He was a Fellow of the Royal Australian Planning Institute, the Australian Institute of Landscape Architects, the Australian Academy of Technological Sciences, and the Australian Academy of Humanities. His books include Swan River Landscapes, A Landscape for Learning and Sense of Place. 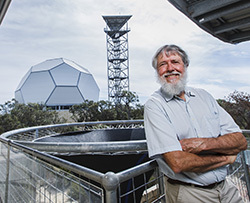 He was awarded the Eureka Prize from the Australian Museum in 1995, the Mawson Medal from the Academy of Science in 1996 and a Lifetime Achievement Award from the Planning Institute of Australia.